In his new book, From Preschool to Prosperity, Upjohn Institute Senior Economist Timothy Bartik makes a powerful case for the benefits of universal, versus targeted, pre-K. As decades of research affirm, all children benefit from stimulating early care and education provided by a credentialed, properly supported teacher, a small classroom, and an enriching, age-appropriate curriculum. But while high-income parents can provide or fund such experiences, middle-income parents, like their lower-income counterparts, cannot because at $10,000 per year or more, pre-K represents too hefty a proportion of their income. 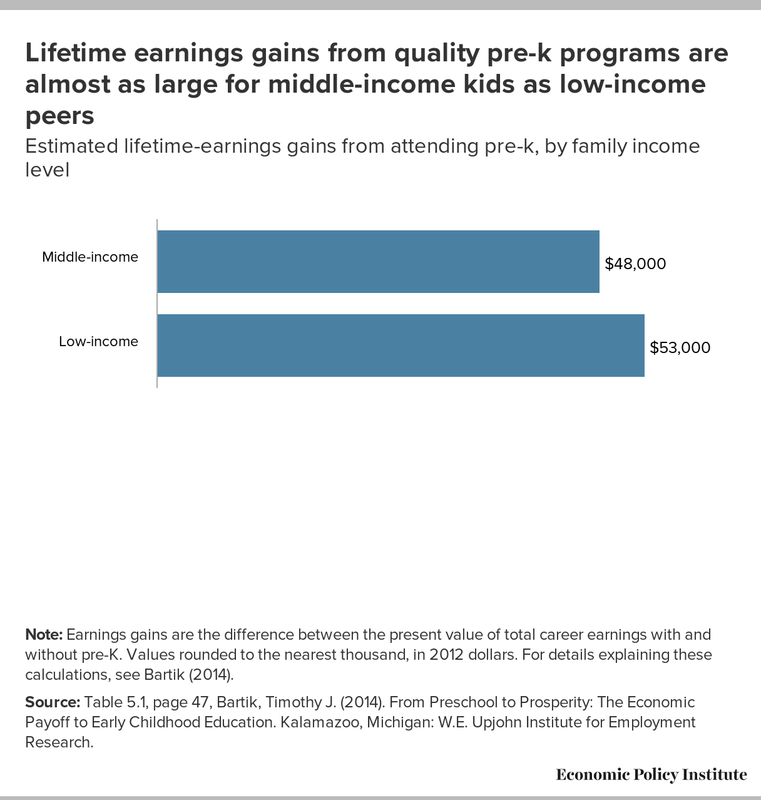 The figure below shows that quality pre-K programs deliver substantial earnings gains for middle-income participants, almost as large as those estimated for their lower-income peers. Note: Earnings gains are the difference between the present value of total career earnings with and without pre-K. Values rounded to the nearest thousand, in 2012 dollars. For details explaining these calculations, see Bartik (2014). Source: Table 5.1, page 47, Bartik, Timothy J. (2014). From Preschool to Prosperity: The Economic Payoff to Early Childhood Education. Kalamazoo, Michigan: W.E. Upjohn Institute for Employment Research. On multiple grounds, Bartik’s book reinforces the president’s and Department of Education’s call for expanded access to pre-K. Universal pre-K programs help many more children; they also have a positive net return and have multiple social benefits. These benefits are too huge to pass up.